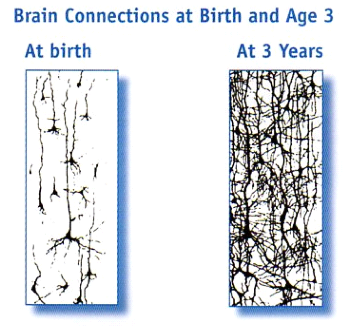 The way a child’s brain develops determines their future. The brain begins to develop within a few days of conception. Most of a child’s brain development is in the first three years of life, so the experiences a child has in these first three years are critical. They can affect how the child will do at school, how easily they will get on with others and whether they grow up to be a happy, confident and secure adult. In short, the level of stimulation from their environment at the beginning determines the child future. The environment in which a child grows determines how their brain develops. A stimulating, warm and loving environment gives a great start. Poor experiences, abuse, trauma and neglect can have a negative lasting impact. At birth a baby has most of the brain cells he needs but only about 15% are connected. Over the next three years the rest of his brain will connect up. These connections are formed by the baby’s response to everyday experiences. The baby experiences through his senses, enabling the connections in his brain to form and grow. The brain of an infant who has had lots of stimulation in the early stages of life, in a loving and caring environment, will have multiple connections and pathways. Loving, tender care to a baby helps develop the hormones that perform these connections. Talking and singing builds connections. Language builds connections. Bad experiences have a tremendous effect on brain development as well. A lack of care, attention and stimulation can have lasting negative effects on a child’s behaviour, ability to learn, ability to make friends and… ultimately his future. Babies neglected and deprived of stimulating experiences have been found to have brains 20 to 30% smaller than others their age. These babies lack the connections needed for them to reach their potential. Children living in a violent situation are always fearful and they don’t relax enough to be able to feel happy, be stimulated and learn well. Boys often become angry, unpredictable and lash out easily. Girls often seem to withdraw. Abuse and neglect in childhood has been linked to depression, mental health problems, early parenthood, family violence, aggressive behaviour, addiction to drugs, criminal offending and suicide in adulthood. Without help, these children face lifelong social, emotional and learning difficulties. Connections laid down in the baby’s brain in the first three years will affect the way he thinks, learns and understands the world as an adult. Giving your child the best possible start is up to you. As the mother you are the child’s world. What you do with yourself during pregnancy affects your child for life. You need to eat well, relax, and keep away from alcohol, drugs and cigarettes. Drugs, alcohol and cigarettes can cross the placenta and damage the brain of your unborn baby. It doesn’t take a large amount of alcohol to cause damage your baby’s brain. Also, if you are stressed the stress hormones can harm your baby’s developing brain. Once your baby is born you need to stimulate him. Spend time interacting, make sure there are lots of smiles, fun, talking, reading, singing, cuddles and play. Responsive, loving care from an adult who cares does more for a child’s development than television, videos, flash cards or computer games. Talk to your baby lots. Laugh with him, tickle him. Give him lots of cuddles. Go for walks in the park and talk about what you can see, the clouds, the rainbows, the leaves and the trees. Remember, they are all new for your baby. Share your knowledge with your child. Sing nursery rhymes. Give him lots of things to feel and touch. Provide toys that are soft, cold, warm. It is vital for children to be in a loving, positive nurturing environment for their brain to develop in a healthy way. Influences around young children must be positive ones. If you want to turn boys into fine men, they have to be around fine men at the start. Surround your children with people who have positive attitudes towards them. Let’s start a change for the good and help all parents to understand the value of surrounding their children with love and language. And remember, it is never too late to change the life of a child!